We truly love our spring merchandise this year. It has been so fun watching it go out the door for the last two weeks. We’ve even been able to restock some of it all ready. Just about everybody has been adding some of our fun jewelry or a new scarf to their baskets, too. The accessories this year are absolutely the best. Oh, and the hair accessories……. We’ve got some vendors that must be working night and day to keep their displays so full. So fun for the girls!! We’re just putting out a really fun gift idea. 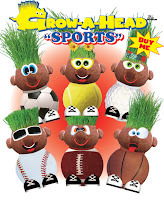 Fun little creatures that you grow grass for their hair… (could be related to the late chia heads?? kinda weird, I know, but I promise….Millie’s boys will like ’em) Very interesting and fun idea geared for about any age. So, pop by to shop or just say hello. We’re just so glad to have spring coming!! yea. Wed. through Sat. through April the 10th. 10am-6pm Then we will close until we start our Spring Weekends…. Friday and Saturday’s beginning on April 30th and ending on June 26th.